Preserve your teeth and your beautiful smile with Podvia & Stanford’s dental services. Using tooth-colored materials, Dr. Podvia and Dr. Stanford are able to reshape a chipped or broken tooth or repair cavities before they are painful for our patients. Worn teeth can look old before their time—and bonding may be an answer to give you back a younger smile. Not all smile makeovers require drastic steps. Ask any of our team or our talented doctors if dental bonding will help you improve your smile. When too much tooth has been broken or eaten away by cavities we can rebuild it to work like before (sometimes even better than before). 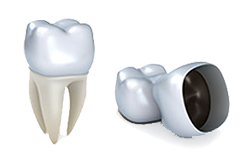 Crowns can give your tooth a natural look with more strength than an old amalgam filling. 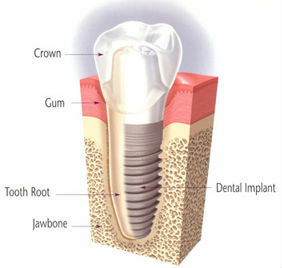 Crowns also protect a tooth treated with a root canal. Crowns may be made with porcelain over a gold alloy inside or all tooth-colored with the new “super” porcelain type materials developed in recent years. How long a crown will last is often influenced by habits such as grinding your teeth, biting fingernails, or chewing ice as well as by the health of your surrounding teeth. Preventing decay and keeping your gums and bone healthy with recommended cleanings will also help your crown to last longer. Are you afraid of the dentist? If you're like 50% of Americans, you're at least afraid of experiencing pain at the dentist. And that's okay, we understand. We also now have a breakthrough solution to this age-old problem. It's called the The Wand® Computer-Assisted Anethesia System, and we think you'll love it as much as we do. Single-Use Disposable handpieces. Allows high levels of infection control. Curious to learn more about this technology? Just ask your doctor or hygienist during your next preventative or restorative visit. We believe you will be amazed by the results! Nitrous oxide, sometimes called “laughing gas,” is one option we may offer to help make you more comfortable during certain procedures. It is not intended to put you to sleep. You will be able to hear and respond to any requests or directions the dentist may have. We will ask you to breathe normally through your nose, and within a few short minutes you should start to feel the effects of the nitrous oxide. You may feel light-headed or a tingling in your arms and legs. Some people say their arms and legs feel heavy. Ultimately, you should feel calm and comfortable. The effects of nitrous oxide wear off soon after the mask is removed. Dental implants are an excellent option for people who have lost a tooth or teeth due to periodontal disease, an injury, or some other reason. 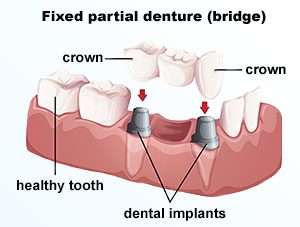 A dental implant is an artificial tooth root that is placed into your jaw to hold a replacement tooth, bridge, or denture. While dental implants are a permanent solution, the crowns and dentures attached to them need to be precisely placed and must be restored or replace from time-to-time in order to maintain your optimum oral health. At Podvia &Stanford, we have the skill and expertise to restore your teeth and dental implants using crowns and permanent fixed dentures that are indisinguishable from your real teeth. We would be happy to schedule a consultation for you. A root canal is a treatment that may allow us to repair and save a tooth that is badly decayed or is infected. During a root canal procedure, the nerve and pulp are removed and the inside of the tooth is cleaned and sealed. Without treatment, the bone surrounding the tooth becomes infected and abscesses or cysts form. "Podvia & Stand for has been my dentist for years.They have always been professional, friendly and always take time to explain what they are doing. I would recommend them highly to anyone." "The staff are very professional, hygienists are very experienced and dentists treat their patients with the utmost care!!" "They are the absolute best! I have been going to them for over 5 years and they really take great care of your teeth. Everytime I leave Podvia and Standford I leave knowing that they are a great family practice that makes sure your teeth are in their best shape. The love , care, and diligence they show on each and every visits makes all the difference. Xoxo"
"I absolutely love the ladies at this office. They are the sweetest and they truly care about the patients. I've been going to this dentist for several years now and I highly recommend it." "Drs. Podvia & Stanford have created simply the best practice around. Everyone in the office treats you like a personal friend. You are more than just a patient. The care that is provided is top notch. The doctors truly care about your overall health."